The Hobbit: The Desolation of Smaug (2013): Dir. Peter Jackson. Written by: Jackson, Fran Walsh, Philippa Boyens, and Guillermo del Toro. Based upon the novel The Hobbit by J.R.R. Tolkien. Starring: Martin Freeman, Ian McKellen, Richard Armitage, Benedict Cumberbatch, and Ken Stott. Rated PG-13 for or extended sequences of intense fantasy action violence and frightening images. Running time: 161 minutes. 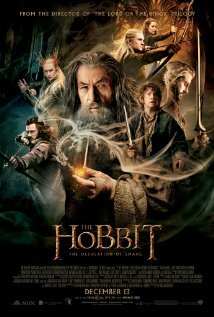 Having just seen this second film in the Hobbit saga, I decided to re-read my review of the first installment from almost a year ago. What had I seen in that version, with all its problems, that left me more satisfied than this version? Revisiting my thoughts, I noticed that while I had problems with the film’s tone and excesses, I drew praise from the actors, the world, and director Peter Jackson’s focus on Bilbo. That last point may speak most to why I found this second installment Jackson’s weakest Middle-earth venture. Once again we join Bilbo as he and his dwarf companions resume their quest for the Lonely Mountain, their home of which was usurped by the great dragon Smaug. The opening as staged by Jackson seems to bode well for the film, especially when the party enters the mysterious forest of Mirkwood. He reminds us of what he accomplished so well in the Lord of the Rings trilogy, utilizing the camera to disorient the characters and the viewer. But as the adventurers soon find themselves captured by gigantic spiders, Jackson throws us into the first of many muddled action sequences. Rather than use this as an opportunity for Bilbo’s ingenuity, as in the book, the Mirkwood wood-elves show up to deus ex machina the situation. Apparently Jackson and his co-writers were content that Bilbo had already achieved validation in his dwarf companion’s eyes in the previous film. That describes a major problem with this film—it hits all the beats of the book without any clear intention behind them. Of course, that means the film moves along at a nice clip, so it’s difficult to lose too much interest (excepting later scenes in Lake-town). But what happened to Bilbo? Martin Freeman is game as ever, but finds his character marginalized. We begin to see the toll of the Ring on him, but there’s not nearly enough growth as in the first film. Even Ian McKellen is wasted, tasked with spouting exposition and a rather pointless excursion to find an evil entity. Perhaps Tolkien left that part to our imaginations for good reason. Jackson seems more interested in world-building, but sometimes does so at the expense of the characters. He introduces characters, yes, but they usually fail to rise above caricature, and we get great actors overacting. Lee Pace (a Juilliard graduate) as King Thranduil affects a snakish flamboyance that seems to come from another film. And Stephen Fry as the Master of Lake-Town plays him like a cartoon villain, replete with moustache-twirl. Not to mention the Master’s superfluous adviser, whose name I can’t remember but might as well be named Baddy McBad-Bad for all the subtlety Jackson affords him. Benedict Cumberbatch may be the saving grace—his Smaug is animated with precision and acted with impish glee. His performance (using motion capture similar to that of Andy Serkis’s Gollum) nails the dragon’s greed and cunning, even as Jackson doesn’t emphasize the psychological warfare between him and Bilbo. The film often puts psychology on the back-burner and opts for action. Jackson constructs his action sequences like giant Rube Goldberg devices as one ridiculous act of destruction segues into the next, setting off a chain reaction (watch as dwarf Bombur turns a barrel into a missile and then a suit of armor). I praised such an approach in the first film in the goblin mines, but by now they’re growing stale. These scenes burst with creativity for sure, but we’re losing any sense of tension or danger. Secure that the first film has laid a foundation for the trilogy’s aims and characters, this film opts for a more slam-bang approach to storytelling. We’ve seen this trend before in the final Harry Potter films, in which action seemingly took over for character in the second film, resulting in a conclusion I found disappointingly empty. Let’s hope this is brief hiccup for the trilogy. I await the next film with some expectation, but not a little trepidation.